Build competency models tailored to the organization’s strategy, goals, and culture. Create a framework for an integrated talent management system. One-time fee. No annual renewal fees. Use the dictionary to build a competency model now! Follow the process described in this self-instructional program drawn from our Building Competency Models certification workshop. Learn More. Customizable generic models for 12 positions. Learn More. Discount On Building Competency Models Workshop Tuition Fee. License included with license for Competency Interview Guides, Competency Development Guide, and More. 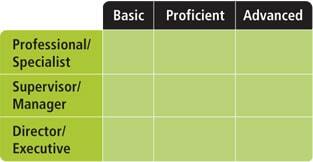 A Competency Dictionary includes licenses for the Competency Interview Guides and Competency Development Guide. Thirty-five competencies in five clusters with definitions, behaviors, and levels by position and proficiency (Spanish, French, German, and Italian versions are available with definitions and behaviors). In language that is easy for everyone to understand. Include assessment of competencies in succession planning process. An intellectual property license gives you the freedom and flexibility to copy and modify the content for use within your organization. You’ll save, time and money and have the confidence that your work products are based on tested, research-based content. This is not a packed software program. It is intellectual property content that you can use in any way you choose, and integrate into your own HRIS or one you that purchase. One-time fee, with no annual renewal fees. The fee is calculated based on the number of employees in an organization who will be covered by HR processes that contain Workitect competencies. This often excludes hourly-rated employees. 1. Format – In What Format Will The Dictionary Be Available? It will be provided in a Word document, Excel spreadsheet, PDF, and online on a web page accessible with a password. 2. Build Our Own – Can We Create Our Own Dictionary Rather Than Purchasing A Generic One? You can. But it will cost your organization a lot of time and money to replicate one like ours that is based on over 30 years of research and practical experience in building models. You can buy ours and customize it to reflect your organization’s culture, language, and performance expectations. 3. Off-The-Shelf Models – Can We Buy Off-The-Shelf Competency Models And Avoid Purchasing A Dictionary? Don’t Jobs With The Same Title Require Pretty Much The Same Competencies In All Organizations? Each organization has its own culture and “way of doing business”. Even for jobs with identical titles, job success in one organization will require some competencies that are different in another organization. Even a small difference could be critical, which is why we only build custom models or teach internal consultants how to build their own models. 4. Technical Competencies – How Can Technical Or Functional Competencies Be Included In Competency Models? These competencies can be determined through interviews and expert panels that are conducted as part of the model building process. The identified competencies can then be listed under the Technical Expertise (#21) competency in our dictionary. 5. Certification – Do We Have To Be “Certified” To Use The Workitect Dictionary? No. But, satisfactory completion of our Building Competency Models workshop is strongly recommended for anyone interested in acquiring an intellectual property license for our Competency Library. Completion of the workshop ensures that use of the Dictionary is built on a research foundation, applied practice, and the knowledge to effectively implement a competency-based human resource system in your organization. 6. Combine With Another Dictionary – Can We Integrate The Dictionary With Another One We Have Purchased From A Different Provider? Yes. You can customize our dictionary and create a “derivative” that combines our competencies with ones you have created and ones in other dictionaries. 7. Upload Into HR System – Can The Workitect Competency Dictionary Be Uploaded Into A Talent Management Or Human Resource Management System? Yes. You can have the competencies uploaded into any system, such as those offered by SAP or Halogen. Our competency library has been pre-loaded into Halogen’s system. 8. Updates – Will The Dictionary Be Periodically Updated With New Or Revised Competencies? Will We Be Charged For The Updates? Updates will be made no more than once a year. The most recent update was made three years after the previous update. Each update will cost $500. The content of the Competency Dictionary can be customized and integrated into the talent management, human capital management, and human resources management software provided by Workday, ADP, SAP Success Factors, SABA Halogen, Cornerstone, and others.